Ah, kids. If ever anyone starts to think they know what they’re talking about when it comes to children, be sure to test that knowledge with real, live, actual children. The little rascals will put you squarely back in your place. I’ve been a fan of Peter Brown’s books for a while and have reviewed several here: Chowder, The Fabulous Bouncing Chowder, and The Curious Garden. 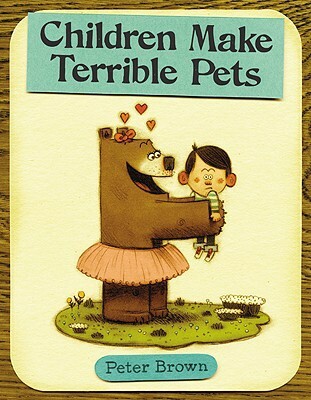 My first impression of Children Make Terrible Pets was cute and creative, unique pictures, nice switcheroo on a well known childhood theme, but not on the same level as the previously mentioned books. Then I read the story of Lucy, the pink tutu-wearing bear who finds a critter in the woods, names him Squeaker, and takes him home to her mom begging to keep him as a pet aloud to a group of second and third graders. Laughter. Roars! Pointing fingers and “Look at that!” Groans and “Ooohhh noooo!” at the surprise ending - sort of like when the Pigeon sees a semi at the end of Don’t Let the Pigeon Drive the Bus. A new Peter Brown book not on the same level as his other books? Bah! Foolish grown-up, trusting his own wisdom. Lucy played with Squeaker. They ate together, napped together, did everything together. However, Squeaker was impossible to potty train, destroyed his share of the furniture, and threw food at tea parties. When Lucy thinks it can’t get any worse, it does. Squeaker disappears. When Squeaker’s hiding place is discovered, Lucy also discovers that what she thinks is best for her - having an awesome pet - may not be the best for the pet. Lucy is forced to make a tough decision based on what’s best for Squeaker. So can I change my opinion? Can I say that I loved the book from the start and knew it would be a hit with kids? No? Then I’ll just share my new-found appreciation of the book now that I know how much kids like it, acknowledge that first impressions ain’t always right, keep the beginning of this review honest, and give the book a well deserved recommendation.